I am the abovementioned person living at the address previously supplied to the police of Leicestershire. 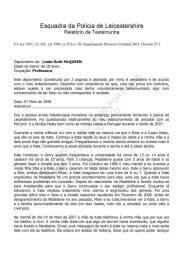 I was questioned about my friendship with the McCann and the Healy families as well as my visits to Portugal during the Summer of 2007. During my childhood I lived with my mother in the same street as Brian and Susan Healy, who are the parents of Kate. I have known Kate since 6 months of age and my mother and hers are still today great friends. We went to the same school even though I was 6 years older than Kate. We continued our friendship during school and into adulthood. Kate met Gerry while at university about 13 or 14 years ago and they married about 10 years ago. They have 3 children, Madeleine almost 5 years of age and twins, Sean and Amelie, who are 3 years old. In October 1998 my husband and I had our daughter, Ellie, and Kate and Gerry married at Christmas that same year. Kate and Gerry adored Ellie, both desired children. Kate wanted to have a tribe of 6 or 7. When Kate became pregnant with Madeleine it was a great event for them, given that Kate had faced problems with conceiving. After the birth of Madeleine the family moved to Amsterdam so that Gerry could continue his professional training. While they were there Kate received IVF treatment and became pregnant with the twins. It was a difficult pregnancy but Sean and Amelie were born healthy in February 2006. Before the disappearance of Madeleine last year, Mark and I used to see Kate, Gerry and the family approximately every two months, we went to Leicester or they came to Liverpool. I spoke with her on the telephone. She was hysterical, saying only that she wanted to be able to hug Madeleine. She was worried by the fact that there were only two police officers in the place and thought that the police were not helping her with anything. She continued to speak about Madeleine, of the cold that she could feel since she was dressed only in pyjamas and continued to look at the situation from the perspective of Madeleine. She told me that Gerry was outside to find the girl and during the following day we spoke on the telephone and we frequently sent messages [to each other]. On Saturday I spoke on the telephone with Gerry who was sobbing and we decided that I would go to Portugal as soon as Nicky Gill and Michelle Thompson returned home, to replace them and to render assistance. During 2007 I travelled to Portugal on 3 separate occasions: from 12 - 19 May; 26 - 29 June; and 19 - 26 August. [their] availability to always give attention to the twins, namely the bath before sleep. During it we would speak about how things had gone during the day and make plans for the following day. the third week that I stayed with them in Portugal. In the second week that I was there, I travelled [to Portugal] with Nicky Gill. We stayed with the Trish and Sandy in the apartment close to Kate and Gerry. On this occasion Gerry drove a hire car but I do not remember if it was the previous car of Sandy or the Renault scenic. In the third week I travelled [to Portugal] with my husband, Mark, our daughter Ellie and the priest Paul Seddon. Ellie and I stayed in the Villa that Kate and Gerry had rented, Paul and Mark stayed in an apartment in the immediate vicinity. During this period both Kate and Gerry drove the Renault Scenic and I travelled frequently in that vehicle. With respect to rooms where I stayed, I noticed nothing strange. With respect to the hired vehicles, I noticed nothing strange in any of them; never was there a disagreeable or intense [sharp] smell. We frequently used the boot of the vehicles to place the things of the children and ours, given that there were two child's chairs in the rear section that left no extra space. That Kate and Gerry could have hidden Madeleine and carried her body inside of the car was uncertain [doubtful/dubious/problematical]. They are both devoted parents and it is incomprehensible that they would have [deliberately] hurt Madeleine. As far as I know, Gerry and Kate were never alone given that the press followed them everywhere, and would not have had a chance to do it [transport the body]. Also, I think that it would have been impossible for Madeleine to have left the apartment by herself. 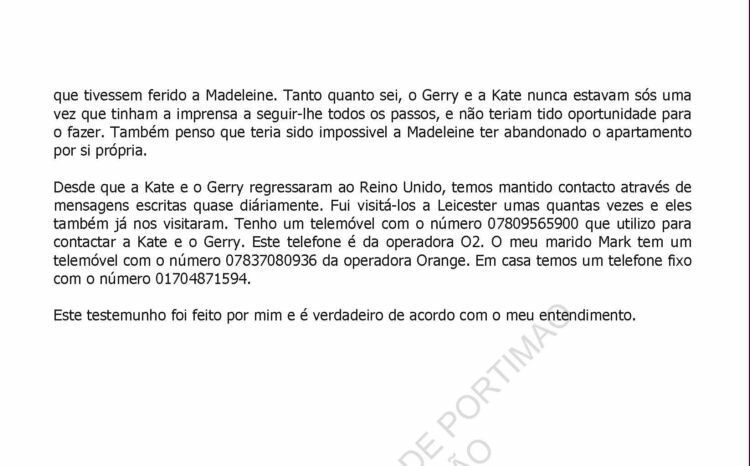 Since Kate and Gerry returned to the United kingdom, we have kept contact through written messages almost daily. I visited them in Leicester once in a while and they also have visited us. I have a mobile phone with the number 0780xxxx900 that I use to contact Kate and Gerry. This telephone is with the O2 service provider. My husband Mark has one with the number 0783xxxx936 with the Orange service provider. At home we have a fixed telephone with the number 01704xxx594.